Anyone who has had a pet parrot or bird for a length of time will tell you that keeping them entertained and mentally stimulated is a full time job! To come up with new ideas can become a daily challenge. Between work, family and other necessities it can become difficult to find the time. Here’s a few foraging and puzzle toys and ideas to keep that feathered friend of yours happy and healthy. Remember, parrots in the wild spend a great deal of time foraging: seeking food, shelters, nests and company. Parrots in captivity must make up for their lack of opportunity for all these natural inclinations. As a parrot owner, it’s up to you to fill in those gaps. A great place to start is with natural foraging and puzzle toys. Branches: fir, pine (sap and needle free), Saskatoon, willow, aspen, sycamore, alder, beech, oak, pear, apple and grapevine (unsprayed), spruce, ash, elm, hawthorn, poplar… again, be able to identify these species! Place on top of your parrot’s enclosure or through wire as perches. If possible, heat sterilise at a temperature of 115C for an hour or use grapefruit extract to clean and lay out in the sun to dry. Use shrubs like Saskatoon and apple when in bloom and let your bird pick the blossoms off. Plant oat, wheat and cat grasses indoor (or outdoor) pots for grazing. Cover with plastic mesh or drop one pot into a deeper pot to keep your parrot from eating the soil. Pine or spruce cones: these are favourites of many parrots. Heat sterilise at 93C for 20 minutes, shut off oven and let cool for 20 minutes in the oven. When ready to use, stuff favourite food items or other chewable toys in the cone for foraging fun. Safe plants: spider plant, jade, pony-tail palm, Swedish ivy, petunia, snap-dragon and nasturtium. Ensure potted plants do not develop mould in the soil. GSE oil (10-15 drops per gallon) used to water plants every 2 to 3 weeks can help to prevent this. Also, make sure the pot is made from bird safe materials. Leafy vegetables (kale, endive, edible flower cabbage, carrot tops, corncob, dandelion, chickweed) are chewable and also nutritious. They can be draped or interwoven through cage wire, tied in with other foraging branches or included in with existing toys. These are just a few of the countless ideas for foraging and puzzle toys to help keep your parrot companion happy and stimulated. Be inventive, but also consider safety first – if you don’t feel completely comfortable with a toy, do not use it! 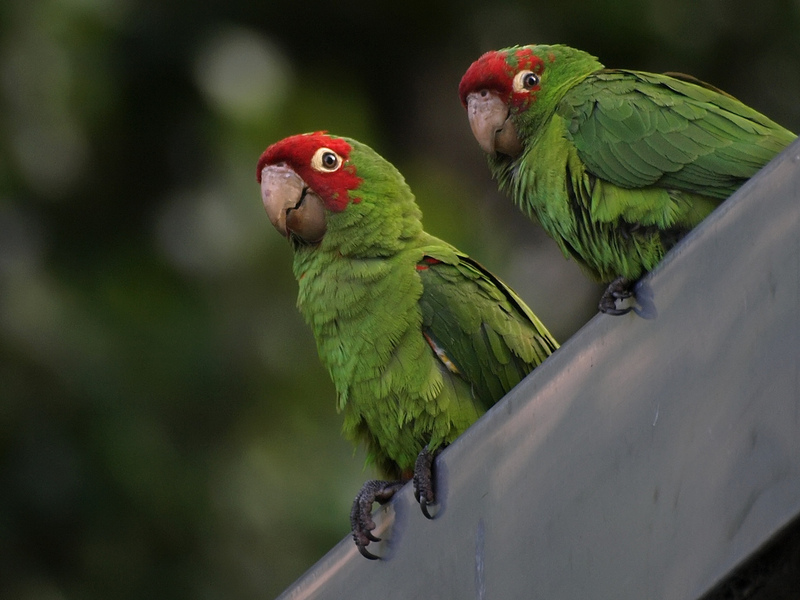 This article was originally written and published by Desi Milpacher and World Parrot Trust. For more articles like this visit our Avian Article section. Previous PostPrevious Post Is your home a safe bird environment?